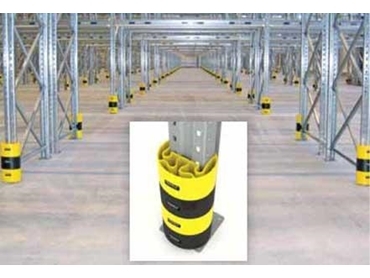 Protect-It pallet racking leg guards available from Barrier Group Pty Ltd are made from advanced thermoplastic materials to absorb large impacts from forklifts or other vehicles in warehouses. Combining clever design with computer aided engineering, Protect-It pallet racking leg guards are also flexible enough to accommodate everyday knocks and bumps. The leg guards consist of an outer wall integrally moulded to a series of curved spring-like energy absorbers at the front and sides to provide two levels of protection for columns. Under light to moderate impacts, the outer wall deforms to resist the impact, and returns to its original shape. Under higher impacts, the outer wall deflects more, contacting the energy absorbers and delivering increased impact absorption. The modular pallet rack protectors can be installed manually in seconds.